Diego Velazquez wears black and navy blue high top Converse “Chuck Taylor” All Stars in the series. Jack Griffo wears black low cut Converse “Chuck Taylor” All Stars in the series. 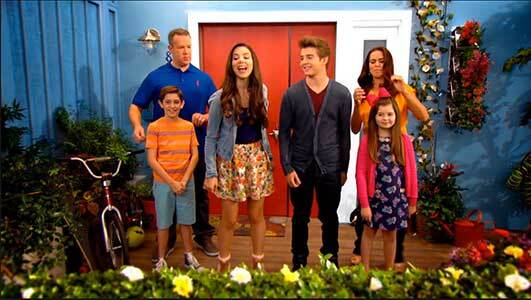 The cast of The Thudermans: Chris Tallman, Jack Griffo, Kira Kosarin, Rosa Blasi, Diego Velazquez, and Addison Riecke. The Thundermans, a family sitcom on Nickelodeon, revolves around a seemingly regular, suburban family with a larger than life secret. The family’s two, fifteen year old twins, are both struggling to adjust to life with superpowers; one will grown to be a super hero, the other will eventually end up a super villain. Phoebe (Kira Kosarin) and Max Thunderman (Jack Griffo) are regular, normal teenagers to the unsuspecting eye, but each keep an every-growing secret. Despite appearing like everyday teenagers—with the frequent appearance of chucks—they work tirelessly to come to terms with their powers of telekinesis, breath of varying temperatures, and the ever important “thundersense,” a power that lets them know when they or their family is in danger. Hank, Nora, Max, Phoebe, Billy, and Barb Thunderman. Barb, Max, Phoebe and Nora in the kitchen. 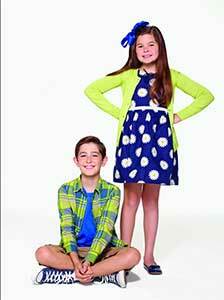 Billy and Nora. The family, so overflowing with super powers and properties, has its fair share of arch-enemies and nemeses, and are constantly balancing the everyday struggle of being a functioning family with the more specialized struggle of keeping evil at bay. The children, especially the twins, deal with crushes and heartbreak, schoolwork and social life, and then come home to face the small task of saving the world from all manner of evil characters. Somehow, they still have the time to complete their homework and all sit down for a family meal at the end of a tiring and super power filled day. The Thundermans face internal threats as well as external ones; Max, as a growing super villain, struggles constantly to keep his evil tendencies at bay. Though he desires to eventually attend Villian University, the whole family works together to keep his powers on the good side, and prevent him from turning truly evil. The whole show is a family delight; it brings to light the complexities and joys of all families, both those with superhero children, as well as those making it from one day to the next without any supernatural powers at all. The Thundermans on their patio.